It was time again for CQWW SSB. However, this year was going to pose a potential problem, as I had just started a full time job in Aberdeen in September. Normally, I travel to Stirling and contest with the Stirling & DARS, but I was quite busy and it seemed doubtful whether I would make the contest at all. However, a few months back, I approached Stewart GM4AFF and explained that I would be living and working full time in Aberdeen, now that I had graduated university and was now in full-time employment. Contesting from the Stirling Club would become difficult and time-consuming to get to, so I enquired as to what contest opportunities were available in the North-East of Scotland. Stewart confessed that there was little interest or activity in HF contesting in this part of the world, but he was happy to see I was interested and ultimately offered to host me at his shack for CQWW SSB, operating as GM3F Multi-One High Power Assisted. I was very grateful to Stewart for the opportunity and accepted his offer. 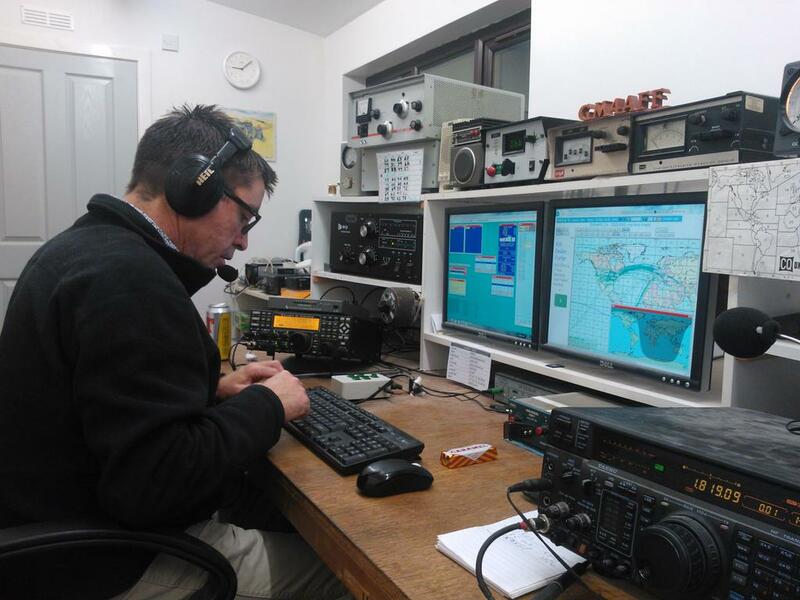 This was not going to be a serious effort; having only 2 ops for Multi-One operation is close to suicide, as Colin MM0OPX and I found out at CQWPX SSB earlier this year. Additionally, Stewart explained that he was in the process of revamping his antenna system and so capabilities would be somewhat reduced, especially on 20m, where we would only have use of a vertical. Stewart also explained that due to the topography of the local area, we couldn’t be a serious contender, but I reassured him that I would be using the contest as an experience builder and to gain more confidence running long shifts in a contest. Due to work commitments, I couldn’t make the contest start on Saturday morning, so Stewart began the contest just after midnight. I took the train from Aberdeen to Montrose early on Saturday morning and arrived in Montrose at around 7:30am. Stewart picked me up and drove me to his house, around 10 minutes from Montrose train station. When we arrived, I was given a quick tour of the shack and then it was time to get to work. Conditions seemed good and the morning and afternoon flew by. It was then time for dinner and I was very appreciative of Stewart’s family for allowing me to join them. Stewart then spent some of the evening operating, before I took over again to do some more operation on 15/20m until around midnight. I then decided to head to bed and Stewart offered to do a small shift into the early hours. Sunday morning and it was another early start. I began by clearing up some multipliers on 40/20m, whilst waiting on 15 and 10 to open up. It was just after lunch (approx. 12pm) when 10m exploded. US, South America, Europe and even some African stations were booming in. Although I have only been licensed for just over 3 years, so I can’t say what the days of old were like on 10m, it was truly incredible. 28.300 to 28.800 were wall-to-wall with signals, with only a few spaces here and there that were truly QRM free. It was unprecedented seeing so much bandwidth filled with stations! I worked a large pile of US stations, but found that there was just so much activity on the band, that it was hard to stand out from the crowd unless you were spotted. The afternoon continued with some good pile ups, as well as a frantic hunt for more multipliers. Before long, it was late afternoon and I wanted to get back to Aberdeen before dinner, as I had some work stuff to do before Monday morning. I thanked Stewart’s wife for her hospitality and Stewart ran me to Montrose train station. We had a chat about the contest on the way there, commenting on the good conditions during the contest. The train was on time and after around 40 minutes, I was back in Aberdeen. Reflecting on the weekend, it was great to have the opportunity to contest from another location other than the Stirling Club and I was privileged to have operated alongside Stewart, given his impressive DXpedition and contesting history, most recently when he was a referee at WRTC 2014. I was very humbled with Stewart and his wife’s hospitality and I hope to contest with Stewart again very soon. In terms of the contest, the bands were in great condition and I was really impressed with the condition of 10m, something which I’m sure I’m unlikely to hear again until the next sunspot cycle! The contest was a great experience in a multitude of ways, including the fact that we had to operate some very long shifts as there were only 2 of us. I look forward to taking the skills I’ve learned into next year and utilising them in the WRTC 2018 qualifying contests. 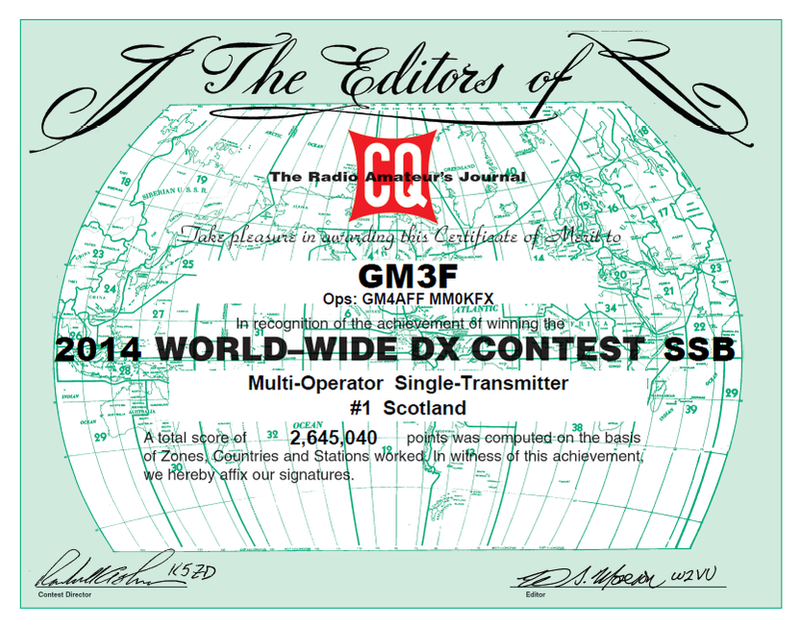 EDIT – July 22nd 2015: A few months ago, the final results of the CQWW SSB 2014 contest were announced. On the 22nd July, Stewart received a certificate awarding us with #1 in GM within the Multi-One High Power Assisted category with 2,645,050 points. A very good achievement, given the antenna set-up, having only 2 operators and only operating for around 30 of the 48 hours!